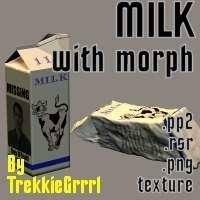 A milk carton with morphs to crumble and flatten it as a piece of trash. more awesome props! great milk pack! could be used for anything tetrapak ^^ thanks a lot! Nice Proper. Works in Poser 8. What kind of "Milk"?...LOL. ThanQ.